These flies are found worldwide and usually breed on dead and decaying animal matter, preferably carcasses or meat. Adults are large metallic blue or green in colour, often seen flying up and down a window. In flight they make a heavy droning or buzzing sound. Larvae are soft pale coloured maggots up to 18mm long. Pupae are a dull mahogany brown in colour and up to 10mm long. The sudden appearance of large numbers of blue bottles indoors is usually the sign of an infestation. Similarly, the discovery of larvae (maggots) in a property usually indicates a problem. In the countryside, Bluebottles help to remove and recycle dead animals and birds. However, their search for meat-based foods in human establishments means they tend to spread disease and are therefore a significant health problem. Females deposit eggs 4-5 days after mating on meat, offal, or excrement. One Bluebottle can lay up to 600 eggs. The creamy white eggs hatch in less than a day and the larvae burrow into the food supply. The larvae reach maximum size in about week and look for a suitable site to pupate. The pupae hatch into adult flies about 2 weeks later. The best ways of controlling or avoiding infestations are good hygiene. Keep dustbins clean, with tight lids and away from doors or windows. Keep meat and other food covered. Large numbers in the home often indicate the presence of a dead bird or rodent somewhere near to or in the house. The most likely place to find a dead animal or bird is in guttering, the loft space or eaves, in chimneys and under the floorboards. 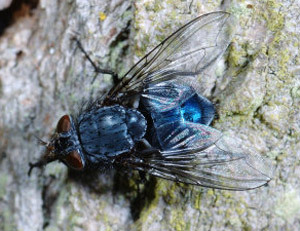 Finding the source and disposing of it is the most effective way of getting rid of bluebottle flies. Insecticidal control using fly sprays (“knock down” sprays) are a good, almost instant, way of dealing with the problem.